We were inspired to launch the festival in 2014. We wanted to mimick the achievements of the Ludlow Food Festival and create an event which showcases the best artisan food and drink in Northamptonshire and help energise the local food economy. With the help of a huge number people - the volunteers who help run the event, the sponsors and our visitors - the festival has put Towcester firmly on the foodie map. We could never have got the event off the ground without the help of our volunteer Festival Makers who help greet and guide our visitors and whose support, so generously given, is so humbling. The festival is a commercial concern which has to make money in order to survive but it is a force for good. Since we launched in 2014, food traders have made connections they may hever have made without the food festival - one won a contract with a Michelin star restaurant - and we have given away nearly £3,000 to support local charities. We support food start ups and local producers by giving them dscounted places. We are always looking for more volunteers so we can continue to help the local community. If you are able to give up a morning or an afternoon, please email info@towcesterfoodfestival.co.uk, putting the word 'Volunteer' in the subject field. One last thing, we’re happy to hear what you think. So if you have new ideas about ways in which we can improve the show or further provide community benefit then please email them to us. We’re eager to do what we can to help! There will be loads going on at the festival in 2018. 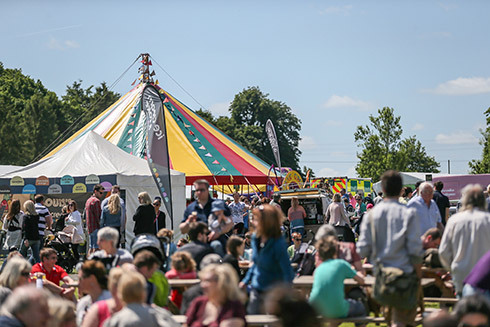 Upt o 100 artisan food and drink stalls, free chef demos, foodies lounge with inspiring talks on food and drink, free wine and gin tasting sessions, two live music lawns and family entertainment, including a free family circus. Crispin Slee founded the festival in 2014. Crispin was named runner up as Local Food Hero in the 2015 Northamptonshire Food and Drink Awards, sponsored by Carlsberg UK, for his work helping to promote local food and drink. He is a passionate foodie and has a long history of celebrating all things 'real' in Towcester. He has run numerous beer festivals in the town, celebrating real ales made by local brewers, and launched Towcester's first sausage and cider festival in 2012, featuring real cider from artisan producers and gourmet sausages made by hand in Northamptonshire. Louise Ward manages the festival. Louise, a mum-of-two from Towcester, first joined the team as a volunteer back in 2014. She was so brilliant, we gave her a job. As well as playing a vital part in the organisation of the festival, she manages our volunteer programme. Masterchef judge, food critic and writer William Sitwell is our Patron. He opens the festival each year, and tours the stalls seeking out the best local produce. Kevin Ackerman is the event director. Kevin is Chief Executive of Towcester Racecourse, the beautiful parkland setting for the Towcester Food Festival. We also have a brilliant team of volunteers who help run the event - some of whom give up their whole weekend because they enjoy it so much!